As New York slowly starts blooming into a fruitful spring season, the frigid temperatures move briskly aside for warmer, pleasantly satisfying breezes. One of the best ways to say “so long” to the wicked winter weather and to celebrate the return of the long-awaited spring season is aboard one of our finest luxurious private yachts, the Eastern Star. One of our most popular yachts, Eastern Star stands out among Metro Yacht Charters of New York’s classic fleet. This 85-foot classic mahogany beauty offers guests a welcomed change from the standard “floating restaurants” cruising the NY harbor. From the moment you step aboard, you’ll understand why Motor Yacht Eastern Star is unlike any other. Rich wainscoting, gleaming brass and designed for comfort furnishings enhance the ships refined and unassuming luxury. Her Ralph Lauren-style interior includes an elegantly appointed main salon, a cozy book filled library with graceful upholstered seating, a mahogany bar and a wood-burning stove that glows on cooler evenings. Her versatile upper deck, with spacious bar, ambient lighting and palm trees, offers both dining and lounge areas—perfect for relaxing while enjoying the spectacular views of Manhattan, the Hudson River Valley or Long Island Sound. Known for its reviews for exceptional service and cuisine, the Eastern Stars’ Executive Chef and professional crew will ensure your fine-dining experience is truly memorable. 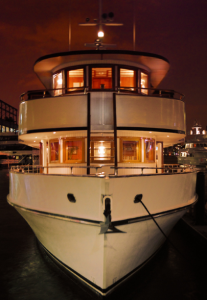 Motor Yacht Eastern Star – A choice vessel for hosting your next milestone or corporate event. Imagine exchanging your vows against the backdrop of the “Greatest City in the World! Dance the night away with family and friends on that milestone birthday or anniversary celebration. Gather your co-workers and colleagues for a team building experience they’ll want to rebook year after year. As the spring season flourishes, why not experience the true meaning of “yachting in style” aboard the elegant, private Motor Yacht Eastern Star. For more information on menus, rates and availability Contact us today to for a quote.